"Now three of the thirty captains went down to the rock to David, into the cave of Adullam; and the host of the Philistines encamped in the valley of Rephaim. And David was then in the hold, and the Philistines' garrison was then at Bethlehem. And David longed, and said, Oh that one would give me drink of the water of the well of Bethlehem, that is at the gate! And the three [the three mighty men] brake through the host of the Philistines, and drew water out of the well of Bethlehem, that was by the gate, and took it, and brought it to David: but David would not drink of it, but poured it out to the LORD,  And said, My God forbid it me, that I should do this thing: shall I drink the blood of these men that have put their lives in jeopardy? for with the jeopardy of their lives they brought it. Therefore he would not drink it. These things did these three mightiest. " The books of reference used for this study of the book of I Chronicles were the Bible, King James Version, called "The Companion Bible", Publisher Kregel; Strong's Exhaustive Concordance of the Bible, numbered to the Hebrew, Chaldee, and Greek, and English, coded to the Strong's Concordance numbers. "Up to the Captivity. [1:1 - 9:1]"
"Genealogy, the Details. [1 - 54]"
"Direct Descent, David to Zedekiah. [1 - 16]"
"The Descendants of Jeconiah. [17 - 24]"
"Judah's Posterity. [1 - 4]"
"Caleb, the Son of Hur. [11 - 20]"
"Sons of Shelah. [21 - 23]"
"Sons of Simeon. [24 - 43]"
"Lineage of Reuben, (to captivity). (1 - 10]"
"The sons of Gad. [11 - 17]"
"Reuben, Gad and Half Manasseh. [18 - 26]"
"Sons of Levi. [1 - 3]"
"The Priests, to the Captivity. [4 - 15]"
"Gershom, Kohath, and Merari. [16 - 48]"
"Sons of Aaron. [49 - 53]"
"The Cities of Priests and Levites. [54 - 81]"
"The sons of Issachar. [1 - 5]"
"The sons of Benjamin. [6 - 12]"
"The sons of Naphtali. " "The sons of Manasseh. [14 - 19]"
"The sons of Ephraim. [20 - 29]"
"The sons of Asher. [30 - 40]"
"The sons of Benjamin. [1 - 32]"
"The stock of Saul and Jonathan. [33 - 40]"
"The House of Saul overthrown. [1 - 14]"
"The House of David Established. [1 - 29]"
"David's Mighty men Appointed. [10 - 47]"
"David and Israel's armed Auxiliaries. [1 - 37]"
"In Ziklag. [2 - 23]"
"In Hebron. [24 - 37]"
"The Tent. David's bringing up the Ark for the Tent. [13:1 -16:43]"
"Ark Removed from Kirjath-Jearim. [1 - 14]"
"Kenite King Hiram of Tyre, Builds David's House." "
"David's Children. [2 - 7]"
"David and the Israelites War Against Palestine. [8 - 17]"
"Removal of Ark from House of Obed-Edem." "The Blessings of YHVH. [2 - 43]"
"Blessings to the People. [2, 3]"
"Psalms of Praise. [7 - 36]"
"Response by People, Ministrations. [36 - 42]"
"David's Preparation for the Temple. [17:1 - 22:19]"
"Purpose Declared; Nathan's Reply from God. [1 - 15]"
"David Sitting before YHVH. [16 - 27]"
"Conquests of David in Syria. [1 - 5]"
"Garrisons in Syria. Subjection and Preservation. " "Conquests of David in Edom. [7 - 12]"
"Garrisons in Edom. Subjection and Preservation. " "Conquests; Provocation. [1 - 5]"
"Conquests; the Wars. [19:6 - 20:8]"
"Conquests, wars with Ammon and Syrians." "The Punishment. [9 - 15]"
"Site of the Altar. [23 - 26]"
"Site of the Temple. [26 - 30]"
"David's Intent to Build the Temple." "Command about Strangers, Workmen. " "Solomon's Charge. [5 - 13]"
"Preparation and Workmen. [14 - 16]"
"David's Command to Princes. [17 - 19]"
"The Princes and Priest's Appointments." "The Service in the House of the Lord. [24 - 32]"
"Divisions, Sons of Aaron. [1 - 19]"
"Divisions, Sons of Levi. [20 - 31]"
"Sacred Appointments of the Sons of Asaph." "Divisions: Courses or Assignments to Levites. [1 - 25]"
"The Dedicated Things. [26 - 29]"
"Preparations, People Placed in Charge." "Solomon's Charge. [1 - 5]"
"Gifts by Princes. [6 - 8]"
"Preparation. Devotions. 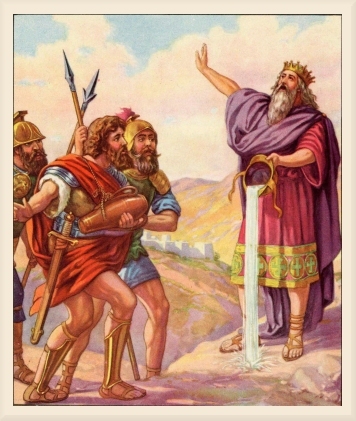 [10 - 20]"
"Solomon's Second Investiture. [22 - 25]"